The Society for Human Resource Management® says the average cost to hire one person is more than $4,000, and the process takes about 42 days. That means when you finally find the right candidate, you’ll want to close the deal quickly and get them on board. You’re probably already using innovative hiring practices to attract top talent, reduce turnaround time and minimize the cost to your organization. Here are some additional strategies that can help you close negotiations with a resounding yes. Assume yes from the start: It’s never too early to impress recruits. Send a key ring as an interview confirmation. It’s a fun way to show that they are one step closer to having keys to the office. Check in frequently during the interview process to ensure you’re both on the same page, and resolve any objections as they come up. If you decide the candidate isn’t right for the job, let them know right away. Candidates will appreciate the honesty, which will boost your reputation regardless of the outcome. No matter how you feel about the candidate, send a thank you note after the interview. 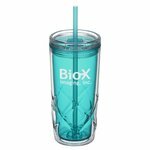 Put it inside a ThermalTraveler Tumbler to make a statement. Promote your brand: In a recent Glassdoor® study, 84 percent of people said they would leave their current job for a company with an exceptional reputation. Having a strong website, creative marketing and positive employee testimonials are key, but many job seekers are looking for more. They want to know about the work/life balance, growth opportunities and culture at an organization. When interviews are taking place, encourage your existing employees to wear their best company swag, such as a Yosemite Knit Jacket, to show they’re a team. Invite top candidates to a picnic lunch packed in a lunch cooler bag with current employees so they get honest information about the company. After the interview, send candidates off with a 3-in-1 charging cable set with ear buds to let them know how “charged up” you were about your time together. Wow them: Make them an offer they can’t refuse—and do it quickly! If the interview goes well, make them a verbal offer on the spot. Then send a formal offer with an executive trim USB drive. Show candidates who will need to relocate how serious you are by gifting a laptop rolling luggage bag. When you have an accepted offer, don’t stop reinforcing your enthusiasm. Send a thank you with an Executive Napa Wine Case or 5-piece BBQ Set. These innovative hiring practices will turn your future employees into fans! Wondering if a candidate would be a good fit for your company? Learn how to conduct a good interview and narrow your search with these tips for interviewers.